There is no doubt that Africa is already on an upward trajectory. Per-capita income in sub-Saharan Africa grew by 35% between 2000 and 2014 and poverty rates are falling, with the percentage of people living on less than $1.90 a day declining from 54% in 1990 to 41% in 2013. Most of this growth has come in countries that have prioritized agriculture. For example, 25 years of steady growth in Ethiopia’s farm sector cut rural poverty rates in half and in Rwanda, poverty has reduced by 25 percent over the same period powered by a growing agricultural sector. The result of this progress is jobs and improved livelihoods for millions of African families. Of course, it isn’t all sunshine and rainbows. Despite the progress we are seeing, the agriculture sector is still largely underdeveloped. Productivity remains below potential due to inadequate use of yield improving technologies like high-quality seeds, limited access to finance, inefficient markets, limited rural infrastructure and gaps – notably in women access to resources such as inputs, land, labour, and extension services. These challenges are compounded by a sub-optimal policy environment and an inability to prepare for and respond to shocks and stresses. As a result, the continent’s annual food import bill – now at 40 billion US-Dollar – not only remains high and continues to grow. Evidence that Africa can grow its agriculture and improve rural livelihoods abound. For the continent to develop, we must unleash the potential of millions of Africans, most of them small scale, that earn their livelihoods from agriculture and agribusinesses, and provide about 80 percent of the food and agricultural products consumed across the continent. Evidence that Africa can grow its agriculture and improve rural livelihoods abound; as seen in other regions that built modern economies by first strengthening their agricultural sector for inclusive economic growth and jobs creation. Take China for example. Agriculture transformation there kickstarted a rapid decline in rural poverty, from 53 percent in 1981 to 8 percent in 2001. Vietnam, the other example, cut poverty from 56 percent in 1986 to 3 percent in 2018 through dedicated investments in its agricultural sector. The Alliance for a Green Revolution in Africa (AGRA) – a farmer-centred, African-led institution – is committed to transforming the continent’s agriculture as the surest path to inclusive economic growth. We see innovation-driven and sustainable productivity increases, and access to innovative finance and markets, as the key. In our strategy for 2017-2021, we are working with our partners to support 11 African countries and 30 million smallholder farmers households to increase their incomes and improve their food security. We do not seek to replicate food production strategies from Asia, Latin America, or anywhere else. We are pursuing a uniquely African green revolution tailored to the needs and aspirations of our people, the diversity of our continent and the challenges faced by African farmers, a majority of whom are smallholders. Has this worked? Let’s look at the evidence. Since our founding in 2006, we have worked with governments and partners in 18 countries to give farmers access to yield increasing technologies like locally adapted seeds, targeted and judicial fertilizer use and access to markets. Through this work, over 15 million farm families now have access to inputs, training, financing, and markets, enabling them to utilize their farms to generate better lives for their families. We have invested in the training and capacity building of about 700 scientists in crop breeding, soil fertility management and policy formulation in African universities at the MSc and PhD levels. Research by these scientists, combined with that of their colleagues in the national research institutes and in the African universities has, in the last ten years, generated over 650 new crop varieties with traits specifically selected for local growing conditions and that address local farmers needs including drought and pest resistance, increased yields and higher nutrient content. Having grown up in the local conditions, these scientists know best what crops farmers need. One such scientist from Uganda, for example, developed a bean variety that is more nutritious and that, importantly, cooks faster. This was based on her experience growing up and having to walk long distance looking for firewood as well as spending a lot of time keeping watch over her mum’s pot as the beans cooked thereby missing school. Having grown up in the local conditions, these scientists know best what crops farmers need. Work to improve soil health have reached almost 6 million smallholder farmers and revived 1.6 million hectares of badly depleted croplands through our integrated soil health improvement program. To deliver these technologies to farming communities, we have supported the establishment of thousands of local African agriculture businesses, including nurturing 112 African seed companies that have significantly increased local seed production from 2000 tons in 2007 to close to 800.000 tons in 2017 for about 15 crops that are important to African farmers. These seed companies and other input business work with agro dealers – small shops in rural areas – that make the last mile contact with farmers. AGRA has helped set up over 35,000 such shops in the countries where it works. Combined with investments by our partners, this work has reduced the distance the farmer walks to the shop from over 50 km to an average of 11 km in the last ten years. Partnerships with farmers’ associations, financial institutions and small- and medium-sized African-owned agribusinesses have helped African farmers sell some 750.000 tons of produce at a 10 to 50 percent price premium. Based on the lessons we have learned from our first decade of existence, we believe that governments are critical in driving national and regional agriculture transformation. Africa’s future will depend on committed and innovative leadership and regular and rigorous measurement to drive the growth required for agricultural transformation. As the Chair of my organization’s Board of Directors, Mr. Strive Masiyiwa recently said a at high-level event at the German Ministry of Development with the German thought leadership in both public and private sector in Berlin- no amount of money or foreign assistance will transform Africa. The continent’s development will be led and delivered by Africans albeit with a little help from friends and partners. With this understanding, we have decided to work with governments and other key players to identify and articulate capacity gaps, propose evidence-based interventions and make investments to strengthen countries’ state capability to deliver for their citizens. It is now beyond doubt that Africa’s development sits with African leaders. It is now beyond doubt that Africa’s development sits with African leaders. In instances where governments take charge, progress follows. Ghana, a key focus country for AGRA, is an examples of countries that have advanced. Its signature Planting for Food and Jobs program raked in GH¢1.2bn (US$ 270,276,000) in crop value and created 745,000 jobs in its first year alone. Therefore, AGRA advocates for an approach where all interventions – by us, our partners and anybody else involved in the industry – should be guided by and aligned with government’s priorities and vision for the agricultural sector. The evidence we are seeing is that countries are committed to doing what is right for their citizens. The only constrain they face is capacity inadequacy in an area where science and evidence are critical to driving progress. Set up AGRA as an African institution with one of the largest collection of African agricultural experts mostly from the continent who understand the challenges their countries face and are committed to work with others from around the world to bring solutions Africa’s most pressing challenges and to helping governments address their capacity gaps. Achieving the ambitious goal of a food secure Africa, buttressed by a thriving agribusiness sector, requires working with strong and committed partners across governments and the private sector. The German Federal Ministry for Economic Cooperation and Development (BMZ) is one such partner. Through its ONE WORLD – No Hunger initiative, it invests around EUR 1.5 billion annually in food security and rural development. This includes EUR 10 million to co-finance AGRA’s five-year strategy to increase productivity, combat hunger, create jobs and raise the incomes of 1.2 million smallholder farmers in Burkina Faso and Ghana. This partnership with BMZ along with their investments in GIZ and KfW is helping strengthen the adoption of sustainable productivity-enhancing technologies, reducing post-harvest losses, connecting farmers to stable markets and strengthening the enabling environment – including by working with financial institutions to increase farmers access to financing. BMZ’s investment through this partnership is supporting the strengthening of African governments, and is growing SMEs and public institutions that deliver better services to farmers for increased productivity, economic growth and jobs creation. There is no reason why this should not be Africa’s century. Committed governments, an enabling environment for private sector engagement and strong partnerships will be crucial to seizing this moment to drive inclusive economic growth and to create jobs and opportunities in the rural areas. We welcome and appreciate BMZ’s leadership and particularly the work done through the ONE WORLD – No Hunger initiative as well as the Compact with Africa both of which have fostered a relationship with Africa based on a mutual partnership as opposed to the traditional, project-related cooperation. 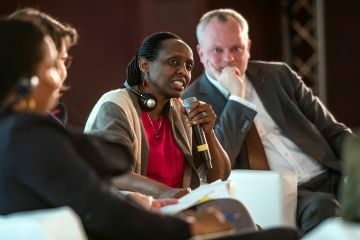 Overall, we recognize the significant leadership role the German Government, private sector, implementing organizations, and civil society have played in supporting Africa’s agricultural and rural development in recent years.